Electric mobility scooters and electric wheelchairs can be prohibitively expensive pieces of medical equipment, but many people need a motorized mobility device to live a normal, independent life. If you receive Medicare benefits, you may be able to get 80% of the costs covered after you pay your yearly deductible. There are two types of Medicare plans, Original Medicare (Medicare A and B) and Medicare Advantage(Medicare C). Medicare Advantage deals with private health insurance providers. Since Medicare Advantage is specific to the private provider, and most people are covered under Original Medicare, we will only be looking at Original Medicare. For more information on Medicare Advantage see here. A medical condition is causing you significant difficulty while moving around the house. You are unable to do normal daily activities like bathing, dressing, using the bathroom or getting up, even with the help of crutches, a cane, or a walker. You must be able to safely get on and off the electric wheelchair or mobility scooter, or you must have an aid who is always available to help you use it safely. The doctor who is treating you AND the scooter/wheelchair provider must both be enrolled in Medicare. The equipment can be used in your home. For example, it is not too big to fit through doorways. If you think you meet all of these conditions, talk to your doctor (the one who is treating your condition) about writing you a prescription for an electric wheelchair or mobility scooter. Mobility scooters are electrically powered vehicles for users who cannot walk long distances without help. To use one, you need to be able to stand and walk for short distances either unaided or with the help of a cane or walker. You also need to be able to sit up and use the steering wheel. If you cannot do any of these things, an electric wheelchair might be a better option. Check out our article on electric mobility scooters for help choosing the scooter that is right for you. 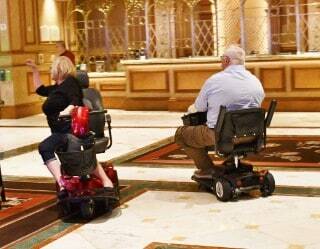 Motorized wheelchairs are designed to accommodate users who cannot walk or sit up unaided. They are typically controlled by a joystick that can be mounted on either arm of the wheelchair. For help choosing the best wheelchair for your needs, see our article on lightweight electric wheelchairs. If you can walk short distances, get an electric mobility scooter. If you cannot walk, stand, or sit up on your own, get an electric wheelchair. Q: Will Medicare cover electric wheelchairs and mobility scooters purchased online? A: No. Online retailers are an extremely convenient way to get access to almost every electric wheelchair and mobility scooter on the market. Unfortunately, the strict rules around being a Medicare supplier stop you from having the online option. Q: Do I pay the full amount and get reimbursed, or do I get billed the copay? A: You will only get billed for the copay and the deductible. Once you get a prescription from your doctor, you or your doctor will send it to the supplier. From there the supplier will deal with Medicare, and they will bill you the 20% copay. Q: Can I choose which electric wheelchair or mobility scooter I want? A: Yes, for the most part. If one local supplier does not have the mobility product you want, feel free to contact another. That is not to say that you will definitely be able to find exactly what you want. To choose a scooter that meets your specific needs see our article on choosing an electric wheelchair or electric mobility scooter. Q: What is a Medicare billing code? A: Each model of electric wheelchair and mobility scooter has a code associated with it. Your doctor or the supplier will have the code, but it is not something you need to worry about. Q: Where can I find a Medicare-registered supplier? A: Go to the Medicare Supplier Locator. Just enter your zip code and the distance, up to 200 miles, that you want it to search in. From there you can contact the supplier, and they will take over the process of dealing with Medicare. For other questions, you can call Medicare directly at 1-800-MEDICARE (1-800-633-4227) or visit Medicare.gov. Is My Mobility Device Covered?